Tomorrow is the Cinco de Mayo 10k and the running group is meeting to run the 5k course beforehand to warm-up. After that is soccer, more soccer, a friend's birthday party for Shortie1 and then hopefully some rest? (yeah, right) Sunday I hope to get my 15 miler in on one of the trails, weather permitting...in other super-exciting news, I will try to get the product review of the Itty Bitty Bras up this weekend. I received them and tested them out this week and can't wait to share my opinion with the world. :-) I know, I know, I'm quite positive the world is waiting on pins and needles. Pffttt! Don't listen to copiaverborum: She's a crypto-Canadian and she has NO T*TS!1! Ooops! I forgot where I was for a minute. Scratch that second objection to cv, sister! 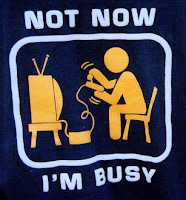 Yes, you sure are busy. And you DID get your review up anyway! WTG, sister! Good luck preparing for the half!